Family | Rebecca Doll - at work, at home, at play: learning things the hard way! The world changed the year Brian was born and most folks likely thing that is a coincidence. The world changed for me that year into a place I didn’t have to be so lost in, didn’t have to be so afraid of, didn’t have to be someone else in. Maybe the world hit a tipping point in the paradigm shift from old-school to new-school outlook or maybe it’s the end of the world. Ever notice how your last few days at a previously unbearable job or house or relationship are not so unbearable? Maybe that’s what happened to little planet earth that year; it became less unbearable. Brian was born into a large extended family (mine) where might was right, kids were to be seen and not heard, and various forms of intimidation were perceived as good leadership, but Brian doesn’t respond to any of that. Brian is four years old and they say he lives with autism. I happen to think Brian lives with himself, but there is no doubt that his family lives with autism. I remember the picnic that his mom and I had by the water. You will likely think it harsh that I took Stella the wonder dog off of her 20-foot leash and clipped it to Brian’s backpack. We tied it to a tree half way between the picnic blanket and the water and talked about how odd it was that the dog wont run away but the boy will. I still think of Katherine as my little cousin though she is Brian’s mom now, and though she never cries about how hard it is, she did that day – it was the first time she didn’t have to chase him since who knows when. Wouldn’t we all run away without our leashes? At each visit Brian warms up slowly and I rejoice that unlike the old-school days, the family members compete for his attention and affection on his terms. He responds to music and texture. He loves books. Cindy Currie will be glad to hear that those romance novels are among his favourites. He pours over each page carefully like he is examining a microfiche and then tears them out one by one. We wonder if he could read pictographs or hieroglyphs and where we could find someone to teach him how. In all kinds of mythology /religions/beliefs they talk about heroes being born in the future who will change the world, change us. Brian was born into the future four years ago and is changing us – our values, our perceptions, our sense of normal – and consequently the world around us just by being himself. Would that more of us could do that. After my mother died we were like six orphans living in an empty house looking after each other. It wasn’t exactly like that but that’s how it felt. Most of us have lost family members and we all know that people deal with it differently. Some wear their hearts on their sleeves and others keep it to themselves. I remember being a hard-case teenager, driven to move forward and forget about the past. I remember when whats-his-name’s behaviour was once explained by having lost his mother and my reply was “What!? That was over a year ago!” as if everyone else in the world just bit the bullet and moved on. People come, people go. Next! When my mother died my sister Rachel was fifteen and she didn’t just wear her heart on her sleeve, she wore all her organs, feelings, needs and wants right out there for the rest of us to share in. Not only were we expected to embrace this but to adapt, conform and get in touch with our own emotions as well as hers. “I haven’t had my three hugs today!” She would declare. What could you do? The girl had just lost her mother so fine, I’d give her a hug. I guess my mother must have hugged her a lot for her to need all of us to fill that void, but this angry teenager wasn’t really into it. The thing is, Rachel wasn’t taking hugs, she was giving them. She was preventing us from each living in our own little worlds and having only living quarters in common. She was making sure we each connected with her daily, acknowledge her, her presence, her person and consequently ourselves. And of course, you can’t go around just hugging Rachel when there are four other people in the house, can you? Eventually I wasn’t just acquiescing, trying to make Rachel feel better. Eventually I was participating. Initiating. Needing hugs of my own. Then I came back to the land of hugs and suffered in limbo for a time as I readjusted: people would lean in for a hug and I’d be leaning in for a kiss there’d be this awkward collision of noses and chins, unintentional gropes. In the summer of 2008 we got Stella the Wonder Dog from Pet Rescue in Toronto. 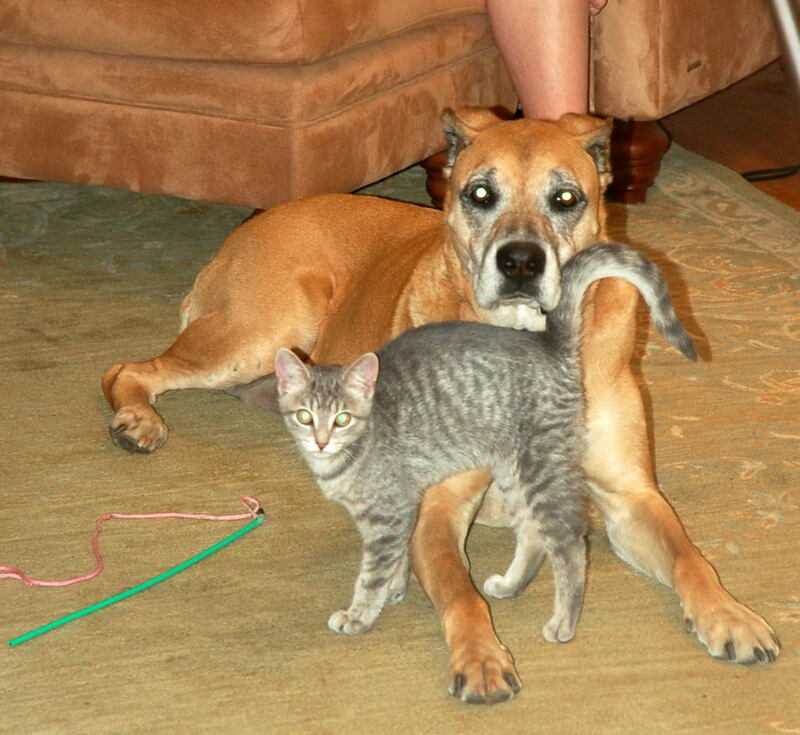 She was a really well-trained seven year old mix of Boxer and Rhodesian Ridgeback with a beautiful temperament. Stella loves people and animals alike. Even people who don’t like dogs are won over by Stella’s magical charm. We speculate that she was a sort of domestic guard dog in a past life, or maybe it’s instinct that causes her to be always on duty when others are around. She guards the house when we are sleeping, herds all the children when we are camping. I expect she enjoys her alone time. However, it wasn’t long until we thought she might like some animal company (besides Kitty Cat who hates everybody) so the following summer we started looking at the Pet Rescue listings again, thinking another dog just like Stella but younger might do the trick. Or a Pug for her to play with, she seems so fond of the small dogs, even the ones that bite her nose. But Stella had other plans. One day as she and Mike set out for an escarpment run Stella unearthed a tiny little kitten under a bush and wouldn’t leave it. “Come on,” says Mike, “we’re here for a run.” And off they go. But on the way back Stella goes back to the bush and this time she wont leave without the little kitten. Having seen a coyote on the trail, Mike supposes that this is the last of an abandoned litter that has already fed the coyote, so he pops it into a Tim’s tray and brings it home with Stella, the proud new mom, beaming at his side. Artois was a beautifully striped grey and white tabby with markings that made him look like he was wearing Egyptian eye makeup. Stella brought him home, licked him clean from head to toe, pushed him over to her food and water, litter trained him (!?) and then curled up around him on her cushion. I guess that’s how some families grow. Kitty Cat, however, was not so thrilled. Kitty would park herself in front of the food whenever Artois wandered near it. Stella, being defensive but gentle would edge her way between the two cats, never meeting Kitty’s gaze but with a body language that said “I know you’re the boss Kitty, but don’t make me do it,” and eventually Kitty would wander off with as much incensed dignity as she could muster. Soon, Artois was more comfortable roaming on his own and Stella let him, and he began to throw up in the car so we stopped taking him. He was on his own against the fierce Kitty Cat, erstwhile terror of Glenlake night life. Artois grew older and made friends all over the street both feline and human. He learned to stand on the ledge of the screen door across the street and ring the doorbell for treats. He learned to ring the Christmas bell on the doorknob at our house when he wanted out. I think it is safe to say he was a neighbourhood favourite. After opening the cafe in Dec of 2009, I seldom saw the cats as a result of a new and unexpected schedule. By the summertime, when I closed up for a break, I hardly recognized Artois. He was much bigger, with faded markings and was less affectionate than previously. At least with me. I was sad at the realization that I had missed half of his first year of life. And yet another half a year went by until one day not too long ago Mike said, “I haven’t seen Artois in a few days,” and we wondered if he’d found greener pastures. But would Artois really leave Stella? “Those people moved out!” said Betty. The next morning Betty knocked at my door with tears in her eyes. She was holding Artois, who had not only been trapped in the appartment for a week, the window had fallen on his paw, which was split open and shaped like a pancake with a dent in it the size of a window frame. His leg was extra long. I put Artois onto Stella’s big cushion and put a small dish of water there. I poured a whole bag of cat treats onto it and Stella sniffed around at the stinky cat. As he ate the food I saw sparkles in it and it looked as though broken glass were falling from his fur. But no, it was tears. Big round tears were running down Artois’s face as he ate. On either side of his nose a crusty black trough channeled them, probably the crust of a weeks worth of crying. Who knew that cats had tears? His eyes were not the big wide-eyed innocent ones they used to be. Mike took Artois the vet who bandaged the foot. A week later the vet said that his foot was dead and that it would spread and kill him. The vet said that for $2000 he could amputate the leg before it spreads or for $200 he could put him down. Mike brought the cat home. Two grand I didn’t have. Two hundred is the sort of thing one can juggle; pay some bill or other another time. But, because of the cafe, I am in debt to neighbours, neighbours who sorely need $200 for their own cats, their own kids, mortgages, you name it. What a dilemma. It’s true, I thought. It’s one thing to put a creature out of its misery, it’s another to put it out of an anticipated misery. So we waited. And Artois slept with me. And he couldn’t get enough attention or affection. And as the bandage got stinky and left soggy footprints on my sheets, I thought I should cut it off, but Stella wouldn’t let me. Every time I went near him with the scissors, Stella would come over and nudge him out of my lap. Eventually Artois got the stinky bandage off by himself. And underneath was a foot. One that looked just like his other foot. And the leg wasn’t any longer. And though he favoured it, he was soon walking and then running on it. And though the fur looks green, which is hopefully my imagination, his claws seem to grab on when I pick him up. He seems to be getting his big wide-eyed stare back and even the affectionate nature that left him six months ago. In fact, it looks like he is not only surviving, but thriving. Bedstemor was 94 when she died and though she had ten children, 32 grand children and who knows how many great grand children, I got her jars of buttons. Not only did she give away all her quilts but everything else too. It was kind of a family joke that if you gave her something you were sure to see it on someone else at the next event. I was a delinquent grand-daughter with grandiose ideas about visiting regularly, documenting all of her stories, writing a book about her, sharing her with everyone. Through her quilting and her prolific letter-writing she shared herself farther afield than she could ever have traveled and became a one-woman hub of family news. When she died she left a simple collection of items and somehow I ended up with buttons. Jars of buttons that represent not only her, but all the people whose clothing was cut up to make the quilts. I have often spread them out, sorted them, admired some and recognized some. I figured that someday I would do something with them but had no idea what. Recently, a neighbourhood jeweller was looking for vintage buttons so I passed the jars to her, sure that they would have a new life. I didn’t think of it at the time, but I suppose it is what Bedstemor would have done. 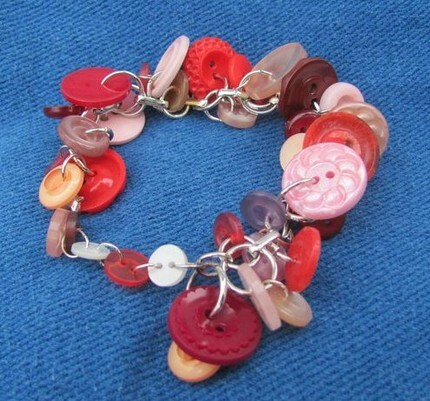 But maybe there is a little bit of Bedstemor in all of us for Julie returned with a charm bracelet; a cluster of Bedstemor Buttons, each link hand-made in a tightly woven pattern like a family, or a community. Each one unique and the whole a stunning creation. Oh crap. I just realized that June went by without a Mom’s day thing. I think this is the first year of… twenty or so that we have missed it. No picnic, no get-together, no graph paper or Joe Louis’. I remember her letter about caring for each other, about doing our work well, about getting together at least once a year and I suppose we are still doing all of those things if not in a linear fashion. I tell myself that is the main thing. That it’s about celebrating the living.